March 20, 2007 -- New Orleans filmmaker Bess Carrick will present her recently released one-hour documentary film, “Lindy Boggs: Steel and Velvet” on Wednesday, March 28, at 1-2 p.m. in the Student Union Auditorium at Arkansas State University, Jonesboro. Carrick will hold a question-and-answer session after the film. She will also address what it is now like to live and work in the Gulf Coast region in post-Katrina conditions. The screening of “Lindy Boggs: Steel and Velvet,” and the question-and-answer session with filmmaker Bess Carrick are sponsored by ASU’s Department of History and Phi Alpha Theta, ASU’s chapter of the national history honors society. The film and q-and-a are free and open to the public. “Lindy Boggs: Steel and Velvet” tells the story of the former Louisiana congresswoman and ambassador to the Vatican. By any standards, Corinne Claiborne “Lindy” Boggs has had a remarkable life and a remarkable career. The wife of former House Majority Leader Hale Boggs and mother of three, Lindy Boggs took over her husband’s congressional seat when the small plane he was traveling in disappeared over the mountains of Alaska in 1972. After winning a special election to fill the seat, the Pointe Coupee Parish native became the first Louisiana woman elected to Congress. She served nine terms in Congress with seats on the powerful House Appropriations Committee and the Select Committee on Children, Youth, and Families. 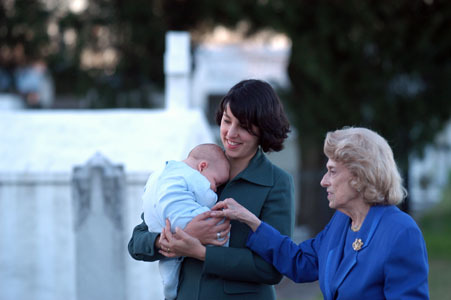 During her tenure, Mrs. Boggs spearheaded legislation on everything from civil rights to equal pay for women. She also helped to found the Women’s Congressional Caucus. Mrs. Boggs still holds the distinction of being the only woman with a room named for her in the U.S. Capitol Building. Her tenaciousness in getting legislation through Congress was legendary. Former Louisiana senator J. Bennett Johnson compared dealing with Mrs. Boggs to Chinese water torture because of her persistant, persuasive, and effective methods. 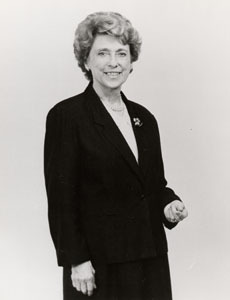 While in Congress, Mrs. Boggs was the first woman to chair the Democratic National Convention and the first woman to serve as a regent on the Smithsonian Institution board. She also presided over the Bicentennial of the American Constitution in 1987, as well as the commission commemorating the 200th anniversary of Congress. After ending her congressional career, Mrs. Boggs, a devout Catholic, was appointed U.S. Ambassador to the Holy See in Vatican City by President Bill Clinton, and she served in that post from 1997-2001. The political legacy of the Boggs family has grown over the years. Daughter Cokie Roberts and her husband Steve Roberts write a syndicated political column. Cokie Roberts is a Washington correspondent for National Public Radio and ABC. Thomas Hale Boggs Jr. is a successful Washington attorney and lobbyist. The late Barbara Boggs Sigmund was mayor of Princeton, N. J. before her death from cancer in 1990. Rebecca Roberts, daughter of Cokie and Steve Roberts, is the narrator for “Lindy Boggs: Steel and Velvet.” Rebecca Roberts hosts a daily local talk show in Washington, and for four years was the technology correspondent for “The World,” a co-production of the BBC, PRI, and WGBH. She also hosted the Emmy-nominated public television program “Springboard,” from KQED-TV, San Francisco. Roberts has a bachelor’s degree in politics from Princeton University and lives in Bethesda, Md., with her husband and three children. “Lindy Boggs: Steel and Velvet” editor Dawn Logsdon has been editing documentaries for 15 years. 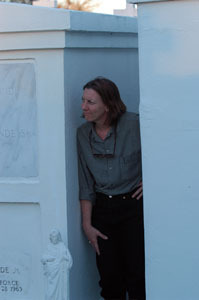 Her work includes the Oscar-nominated “The Weather Underground” and the Sundance Festival-winning documentary “Paragraph 175.” Mike Esneault, who scored Louisiana Public Broadcasting’s award-winning six-part series “Louisiana: A History,” provided the score for the documentary. He has also collaborated with Terence Blanchard on scores for a number of director Spike Lee’s movies. “Lindy Boggs: Steel and Velvet” producer Bess Carrick is best known for producing and co-directing “Backlash: Race and the American Dream,” a look at David Duke’s run for the U.S. Senate and the white backlash movement it spawned. She has also worked with Emmy Award winner Bill Moyers, Discovery Channel, and National Geographic Channel, among others, on television projects. Since Hurricane Katrina, she has worked on numerous film projects, for international and national network distribution, about the storm and its aftermath. Carrick lives in New Orleans and owns the Forest Retreat, near Natchez, Mississippi. For more information, contact the Department of History at (870) 972-3046.